I just can’t get enough of the lush Christmas range. Not only do I love trying out the new products that they release, I am also a huge Christmas fan and love everything and anything to do with Christmas. So when I saw that there were releasing a little Santa inspired bubble bar I couldn’t wait to give it ago. 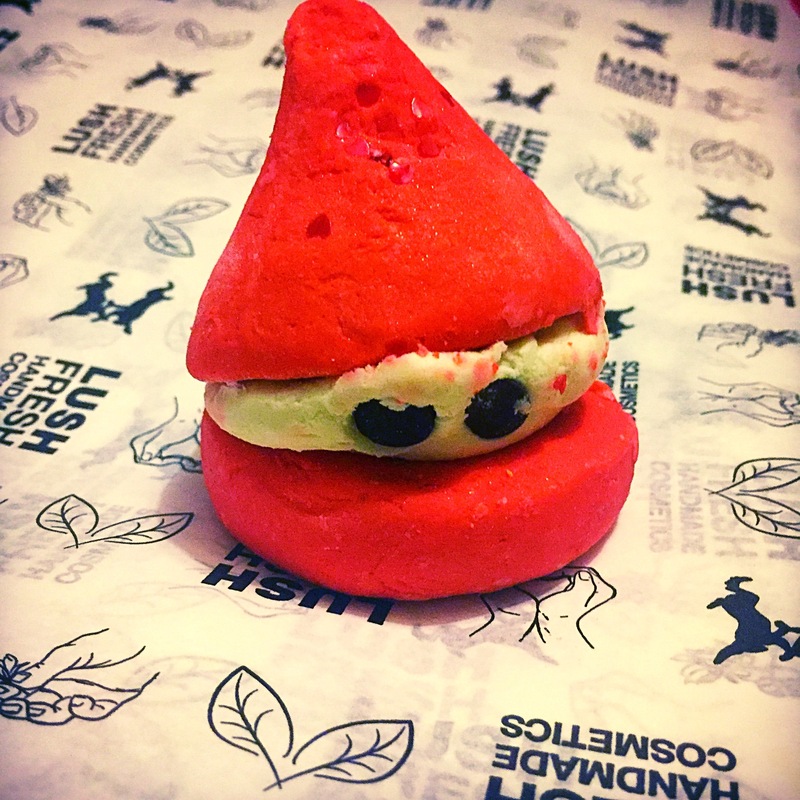 Peeping Santa has got to be one of the cutest products that lush have released this year. With two large size bubble bars sandwiched together with creamy Shea butter filling. 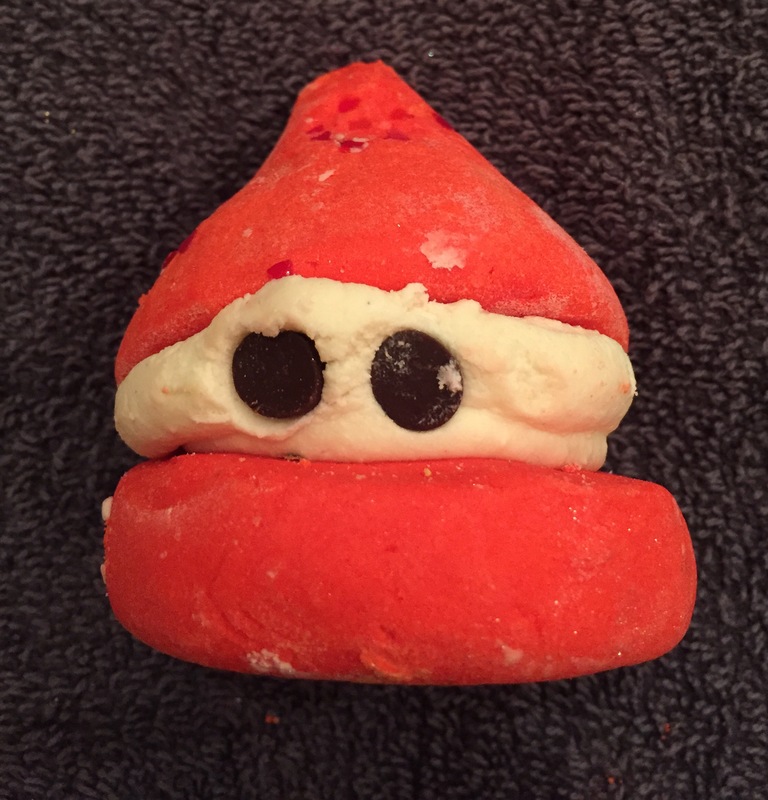 This bubble bar resembles a little Santa complete with hat and chocolate eyes. I didn’t no wether to eat this or keep it on my shelf it looked so good. 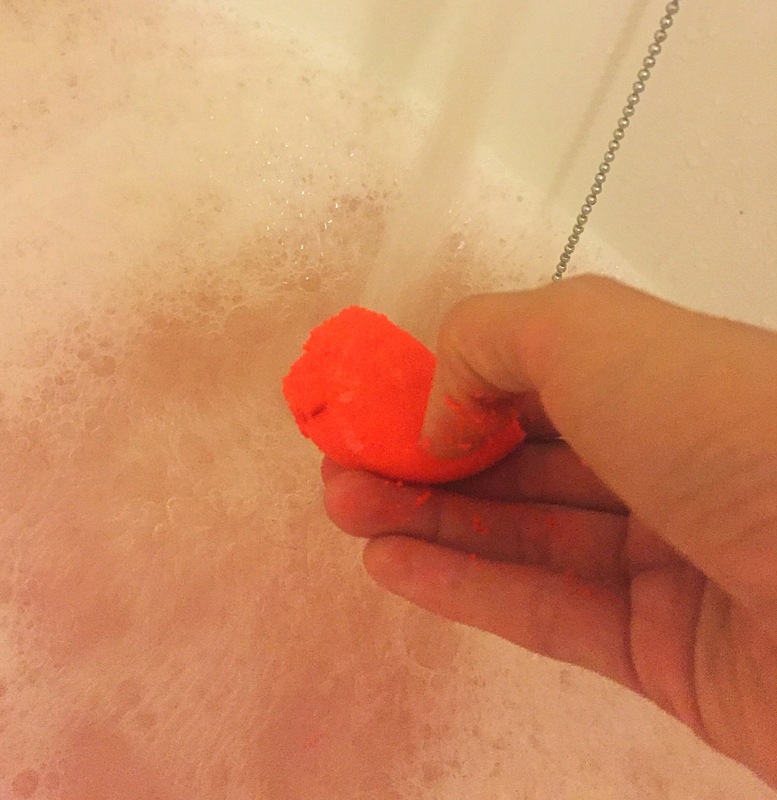 I was really impressed with the size of this bubble bar and you would easily get three baths out of it which makes it great value for money. And means that you can enjoy it over and over again. Peeping Santa has a very lovely strawberry scent which is very similar to the yummy yummy yummy range that some of you may have tried before. Although I love strawberry scents I’m not normally a fan of the lush take on strawberry. But I found that peeping Santa is a little more of a fresh fruity strawberry scent and I found myself really liking it. The main ingredients in peeping Santa are bergamot and geranium oils which help to give an uplifting and relaxing experience. The two parts of the bubble bar are sandwiched together with a creamy concoction of Shea butter and cocoa butter which give a lovely vinilla scent to the rest of the product and also gives a moisturing effect when popped in the bath. I chopped my bubble bar up and used his hat wich is covered in cute little stars and a third of the creamy butter filing. Once this was crumbled under the running water it created loads of fruity smelling bubbles. I was very impressed with the amount of bubbles and pleased to see that I still had plenty left for another couple of baths. The water also turned a lovely pinky red, which ment once the bubbles had all dissolved (which was after ages) , you are still left with a beautifully coloured water. 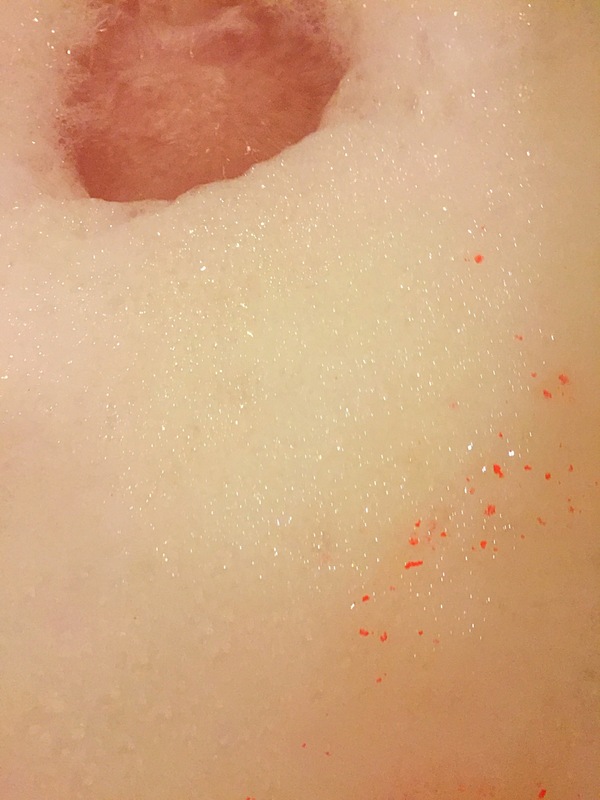 The bubble bar did create the most lovely soft silky bubbles and the scent was really strong and stayed around for ages which doesn’t always happen with bubble bars. Due to the Shea butters and cocoa butter the water was exstremly moisturing and my skin felt silky and soft after the bath. Overall I was exstremly impressed with this bubble bar and I just adore it’s sweet fruity scent. Top tip – you can defiantly chop this bubble bar and use it for more than one bath. Ingredients – Sodium Bicarbonate, Cream Of Tartar (Potassium bitartrate), Sodium Laureth Sulfate, Fair Trade Organic Cocoa Butter (Theobroma cacao), Lauryl Betaine, Cornflour (Zea mays), Perfume, Bergamot Oil (Citrus Aurantium bergamia), Olibanum Oil (Boswellia carterii), Geranium Oil (Pelargonium graveolens), Fair Trade Shea Butter (Butyrospermum parkii), Titanium Dioxide, Laureth 4, Benzyl Alcohol, Hexyl Cinnamal, Limonene, Colour 14700, Colour 45380:3, Dairy Free Chocolate Drops.